Items on the Estacada Grade School lunch menu included spaghetti, turkey noodle soup and macaroni salad. Ralph and Ethel Wagner had recently opened the Estacada Furniture Mart at 353 S.W. Broadway Street. "The Mart will have all kinds of used furniture at reasonable prices," The News reported. "Come in and get acquainted, always free coffee." 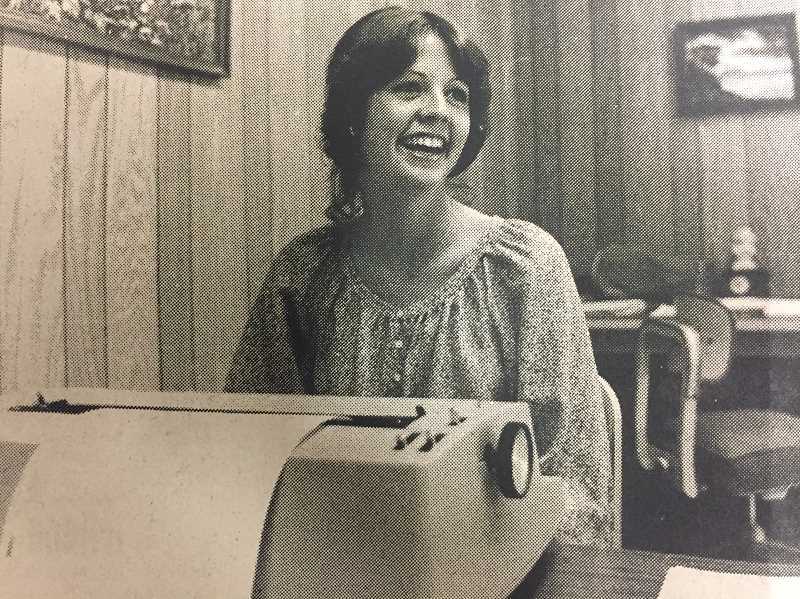 Estacada High School business teacher Jan Brock had organized a work study program that connected students with local businesses. Participating locations included State Farm; Estacada City Hall; and Bidgood, Carley, and Scrivner's dental office. In a letter to the editor, parents of high school student Janis Cheeck thanked Brock for organizing the program and the businesses for participating. "These firms and their people were so willing and so helpful to the students — though the students are not paid, it does cost the firms in time and patience, and we'd like them to know we do appreciate what they've done," the Cheeks wrote. Showings at the Broadway Cinema included "Here Come the Tigers" and "Another Man, Another Chance." Estacada resident Dorothy Parker planned to facilitate a singles group for people ages 40 and older. "Some of us thought it would be nice," she said. "The female response (to a recent classified advertisement) was good. We got calls from a couple dozen gals but there wasn't much male response." She added that the group could bring something new to town. "There hasn't been anything for single people in this area to get acquainted through — especially if they work in Portland. Several of us have been involved in Portland singles groups but a couple of those were a real disaster." Estacada High School junior Joann Baker set a new school record by scoring a perfect 800 points on the verbal portion of the Scholastic Achievement Test, or SAT. Baker scored 610 on the test's math section, bringing her total score to 1,410 out of a possible 1,600 points. Baker planned to retake the test later in the year. "My goal is to bring the math score up at least 40 points, which would give me a total of 1,450," she said. Baker planned on becoming a doctor. The Estacada News encouraged residents to take a copy of the newspaper with them on vacation, pose for a photo with it and send the photos in for publication. "At least once in your life you've probably picked up a postcard when you were on vacation, scribbled a few notes about how much fun you were having and send it home to your family and friends," an editorial read. "This summer, when you pack your bags for a vacation, we want you to send us a postcard of sorts. Stuff a copy of the Estacada News into your bag. When you're at a place that's obviously vacation country, pull out the paper and have your picture taken." Improvements to the Sandstone Bridge boater access site had recently been completed. The work, a result of collaboration between Portland General Electric, the U.S. Forest Service and the local boating community, included a concrete stairway with a rail system and boat slide, a new parking lot and a whitewater recreation map.